The publisher of James Comey's book "A Higher Loyalty" is printing 850,000 copies to meet the expected demand from buyers. To put that number in perspective: The initial print run of Michael Wolff's book "Fire and Fury" was just 150,000 copies. Comey's book is shaping up to be the second political publishing industry sensation of the year. It is already guaranteed to be a best-seller based solely on the number of pre-orders. Both books come from the same publishing house, Macmillan, but from different divisions. Macmillan has acknowledged that it did not fully anticipate the interest in Wolff's book. Neither did booksellers. That's because the "Fury" furor came out of nowhere in January, when excerpts from Wolff's explosive book leaked out and the president's legal team tried to halt publication. "Fury" sold out quickly and the publisher took what it called "unprecedented" steps to print more copies. The publisher says more than 2 million copies have been sold across all formats. With Comey, the publisher had time to be better prepared. Interest in Comey's account of his time serving as FBI director under President Trump has been building for months. "This is the largest first printing we've done so far this year," Macmillan president Don Weisberg told CNNMoney. Last month a tweet from President Trump helped lift Comey's book to #1 on Amazon's constantly-updated best sellers list. The book has been near the top of the list ever since. On Thursday, as the leaks of Comey's book began, it returned to #1 on Amazon. The surge of pre-orders helped the publisher determine how many copies to print. With "Fire and Fury," "A Higher Loyalty" and other titles, Trump is rejuvenating at least one corner of the publishing industry. There's an expectation that he'll keep tweeting, blasting Comey, and that those tweets will juice interest in the book even more. Some interviewers and reviewers had already received copies of the book. 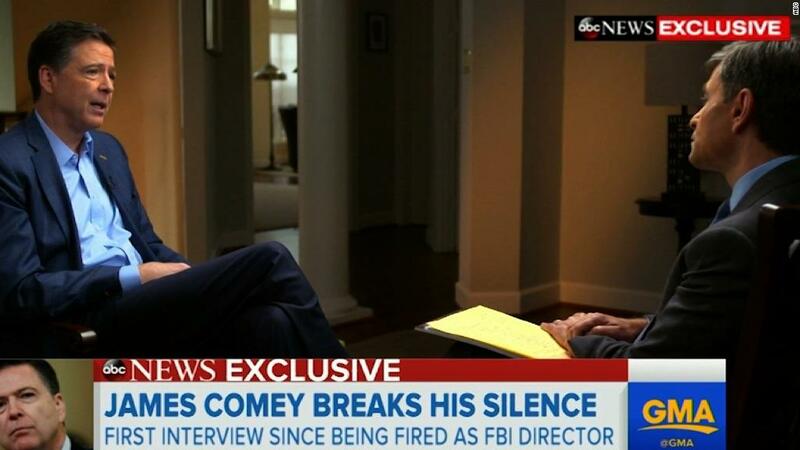 Comey taped an interview with George Stephanopoulos on Monday. So when the leaks started, the Macmillan imprint behind the book, Flatiron, lifted the media embargo, which allowed outlets like The New York Times to publish reviews and other features. Stephanopoulos shared a preview clip from his interview on Friday's "Good Morning America." The interview will air as an hour-long special on ABC on Sunday night. Comey will be on a TV and radio tour all week long, with stops at "GMA," "Morning Edition," "Fresh Air," "The Late Show with Stephen Colbert," "The View," "The Lead with Jake Tapper," "The Rachel Maddow Show" and more.